Plunging a stick in food was a genius idea – I sincerely wish we could thank the person who originally thought of doing that. Think about hard candy. If someone was like ohh, here have some candy and they handed you hard candy you would be like um thanks? But get a stick in that hard candy and it becomes fun! You would totally be happy if someone gave you a lollipop. Take a corn dog... If possible, Seth would probably divorce me and marry the person who came up with that. Take the stick out of the cornbread encrusted hotdog, and he would be like ehhh, ok. But once that stick is there it is all like, ohh my god must have it. Here, we take fresh beef flap meat, marinate it in a homemade teriyaki sauce, skewer it, then grill it over high heat, brushing it with a thickened version of the marinade. Like eating a popsicle, but all meaty and umami. And you know, grilled. And not frozen. Actually the opposite. Place the mirin in a medium pot and boil over high heat. Reduce to medium low and add the soy sauce, rice vinegar, sesame oil, brown sugar, garlic, ginger, jalapeno, and orange peel. Simmer for 20 minutes. Place half of sauce in a Ziploc bag or container and refrigerate until cool. Take thinly sliced beef flap steak and cut into 1½-2 inch strips for skewering. Submerge in cooled marinade and refrigerate for at least another hour. Take bamboo or wooden skewers and soak in cool water for 30 minutes. In a small bowl, whisk the cornstarch with water. Bring the remaining sauce to a boil and thicken with the cornstarch mixture, constantly stirring. Let the sauce cook for 5 more minutes, tasting to make sure the cornstarch has fully dissolved. Once ready, pour into small bowl and set aside. Preheat grill to high (roughly 400°). Just before grilling, take marinated beef and skewer so that the meat can lie flat. Place canola oil in a small bowl. Using a paper towel or cloth, dip in canola oil and rub over hot grates to prevent sticking. Lay beef skewers over heat and stay nearby to monitor. Once bottom is a little charred, brush the tops with canola oil, and flip. 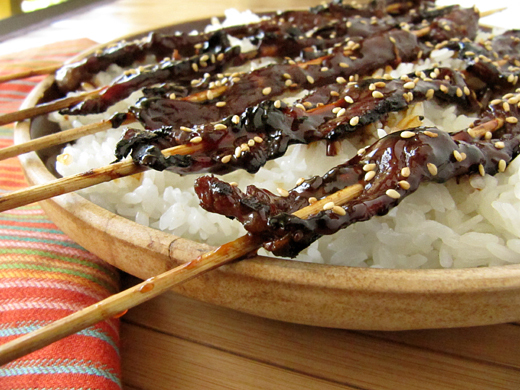 Brush again with thickened teriyaki sauce. Once the bottoms are slightly charred again, be careful not to overcook, flip and brush with thickened teriyaki sauce, so both sides are sauced. Remove and garnish with toasted sesame seeds. Serve with rice. boy..this is beyond delicious...it's HEAVENLY! This looks fantastic and is always something I have wanted to make myself. I would love this for dinner tomorrow! This looks awesome! I love love the recipe. Delicious! Those look so appetizing! The only problem is that I would keep eating them until my belly bursts! Oh my, that seriously looks like meat candy, in the best possible sense. Yum! That beef looks scrumptious!!! What a treat! Meat on sticks! Greatest thing ever. Awesome recipe! I have had meat skewered on a stick like this, but I do not remember it looking so laden with this delicious sauce! I see in the ingredients there is a good fusion with the jalapeno and the asian spices-yum! Also, the consistency of the sauce does guarantee flavor in every bite. Great recipe! I never heard of flap meat before. Ever. But I'm glad to hear of it now - those look insanely good! And yes food on a stick is some of the best. ohhh wow amazing !!! !I would love to try this recipe with chicken !!!!! Yay Beef Yakitori... one of my all time favs. I'll have a double helping of those skewers please... They look amazingly delicious. Wow! The way you describe it sounds mouth watering! :D And yes food on sticks is a great idea! So scrumptious looking! Really irresistible. You're so right. Put something on a stick and it becomes fun and instantly tastes better. These little beefy wonders look scrumptious. Homemade teriyaki sauce! I need to make this. Yum! Those look so delicious! And the stick is definitely a bonus! Food on a stick is delicious all year round but somehow much tastier during the summer. These sound great for a bbq! anything on a stick is a winner in our home, LOL!! my hubby would love this!! These do look fantastic and that sauce really sounds killer. Great for dipping too. Oh, all the flavours I love are going in this! A definite for the BBQ this summer! your yakitory looks fantastic! Wow!!! Yes, this is proof that everything is better on a stick. The opening photo just call out to me. If you find the person who invented meat on a stick, let me know so I can send a thank you letter. Gosh these are making me hungry. Agree! I love food on skewers. I think they were probably meant to walk and eat as I assume this is a street food. Your Yakitori style beef looks delicious! This looks amazing, even better than what I'd get at a restaurant! I love all the flavors in there! hahaha! totally agree! I'm embarrassed to admit that I think corn dogs might be the only thing that get me to eat red meat again :) Those are absolute genius. My friends would LOVE this dish! And its such a fun thing to have for a party! Food on a stick is ALWAYS better! These look so good and packed with so much flavor. Makes me so hungry!! Wow, this looks delicious! You really sliced that beef beautifully--I would love to have some of this. I love yakitori, this looks so good! This looks great and I can't wait to try it!!! I think my pickiest eater will actually try this. Yea!! Thanks so much, and thanks for sharing this great recipe with our Bonbon readers. Yakitori will never fail, I will try this together with your Icecream Tahini receipe, cant wait to try them.